Spring has arrived...time to garden! February has blessed our gardens with rainfall and warm weather. What more inspiration do we need to get out in the garden? Before you get started its always a good idea to make sure you have the proper tools for the proper tasks. 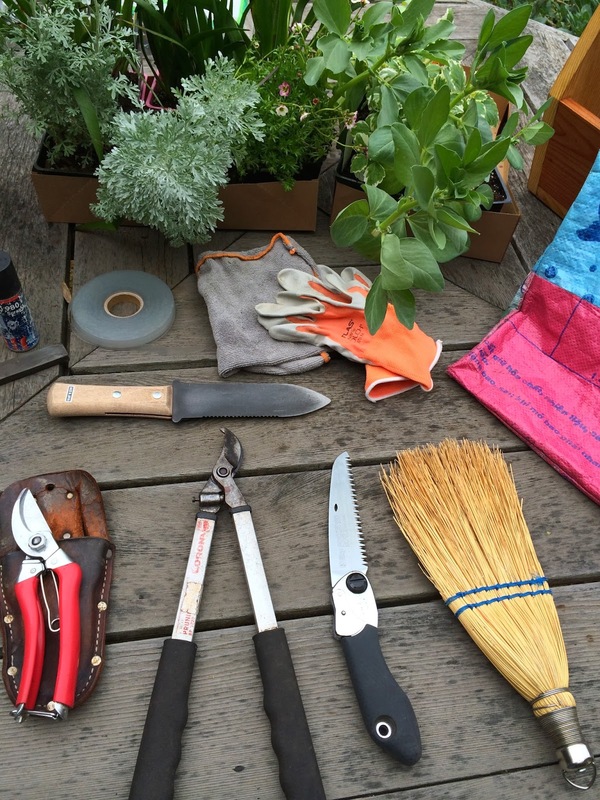 Here I've assembled my most used garden tools. -Felco oil and sharpening stone. I use the oil and stone periodically to refresh my blades and keep pruners and loppers from getting rusty. -Vine tie. Essential for securing vines to trellises and keeping young trees and shrubs upright. -Cleaning cloth. I use this to wipe down my tools, especially if they get wet or gritty from soil. -Debris bag. This bag is made from recycled rice bags and it pretty to boot. I like to clean as I go and this is a perfect size with handles. Easy to transport to the green bin. -Hori Hori (under vine tie and gloves). This is an amazing all in one Japanese tool that works as a trowel, weeder, root unbinder etc. Ideal for use as a trowel in planting 4", it has a cerated edge that allows for breaking through root clumps, and point and beveled edges make it great for weeding-even in cracks! -Pruners and carry case. I've had my case for at least 15 years. It clips to my belt so I know my pruners are never far behind. -Two handed pruners These are great if you're doing a lot of pruning in one go. They require 2 hands which helps avoid carpal tunnel syndrome. -Pruning saw. This small Pocket Boy saw is great for pruning limbs too large for my pruners. A fine tooth saw is a necessity for thinning bamboo. -Hand broom. For small messes or spills that are too small for a standard broom. 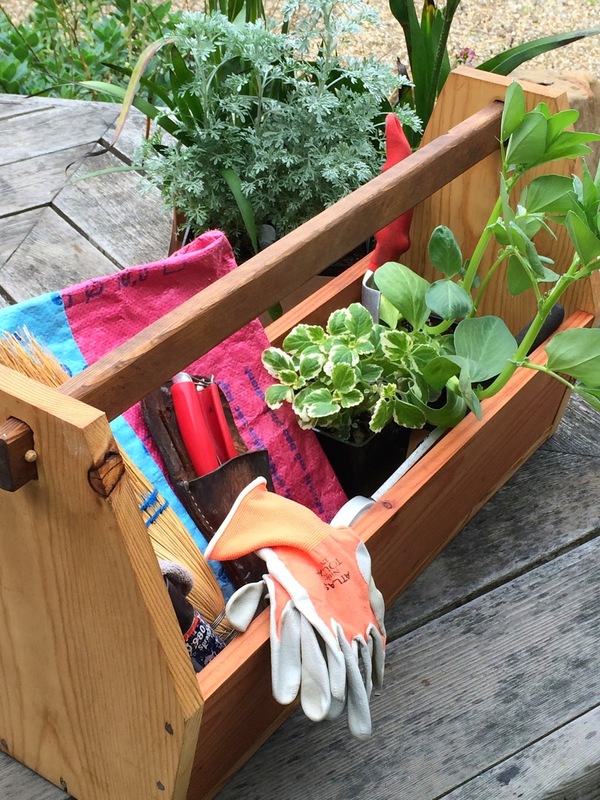 A garden trug keeps everything together and handy. This one was made by friend and artist Brad Rex of Petaluma.